Home > Car Care > How often do brakes need to be serviced? Brakes should be replaced when worn out, but how often do brakes need servicing? Some trucks and cars have rear drum brakes, but most cars on the road today have disc brakes on all four wheels. How disc brakes work: the brake pads are installed on both sides of the brake disc (also known as rotor). When a driver presses the brake pedal, the hydraulic pressure pushes the piston (or pistons) out of the brake caliper. As a result, the two brake pads squeeze the brake disc between them. To work properly, the brake pads have to be able to slide inside the brake caliper towards and away from the disc. In a brake system with a floating caliper found in most cars (in the photo), the caliper itself also must be able to move on its bracket (anchor plate). In this design, the caliper moves on two slide pins. The brakes endure a lot of heat and dust when braking, as well as moisture when driving in the rain. As a result, the rust buildup may cause the brake pads to stick within the bracket or the brake caliper slide pins to seize up. This problem is very common in the Rust Belt. Similar issues happen with the rear drum brakes: rust on the brake drums can cause squeaking, and some components, especially the parking brake parts may seize up due to corrosion or lack of lubrication. Of course, the drum brakes are fully covered by the drum, and they usually can last longer without servicing. When brake pads stick, or the caliper seizes up, the brakes might not work properly or not release fully. This will cause the brakes to overheat and the brake performance will be compromised. The road salt caused excessive rust buld up in this vehicle. The brake pads were sticking and wore out prematurely. You can see the outer pad is worn more. 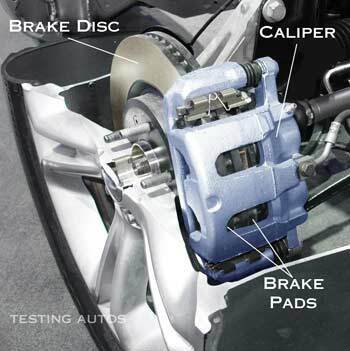 A brake caliper might get damaged from overheating and require replacement. In many cars, this issue is the number one cause of premature or uneven brake pad wear and brake caliper replacement. A squeaking noise coming from brakes is one of the possible symptoms of this problem. In most service shops and dealerships, mechanics inspect your brakes whenever your wheels are removed when doing a tire rotation or other service. Brakes cannot be properly inspected without removing the wheels. That's why, to keep your car safe, we recommend having your brakes properly inspected at least once a year, especially in the Rust Belt. Check the reviews when choosing the shop, you don't want to trust your brakes to an incompetent mechanic. 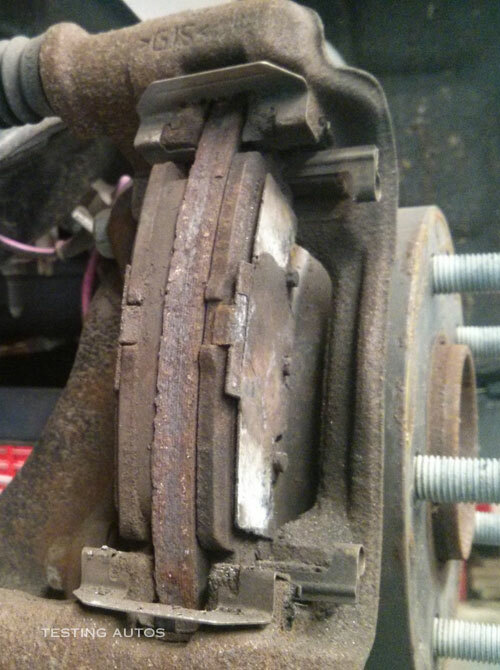 A brake inspection typically involves checking the calipers or rear drum brake components, measuring the brake pad or brake shoe material thickness and inspecting brake discs. If there are signs that pads or caliper slide pins are not moving freely, your mechanic may recommend servicing your brakes. 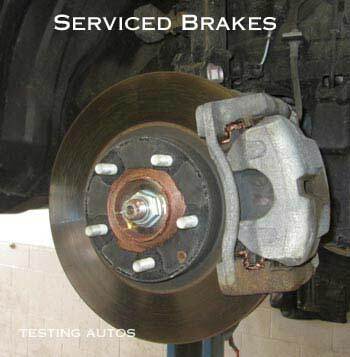 Servicing brakes does not involve replacing any parts. The disc brake service includes removing the pads and calipers, cleaning and lubricating slide pins and the caliper brackets to prevent sticking or seizing. The brake discs (rotors) might also need to be cleaned out from the surface rust, especially on the edges, to prevent squeaking. Servicing brakes doesn't require any parts. The rear drum brake service involves cleaning the components, including the parking brake parts and lubricating parts that need to be lubricated, as well as removing excessive rust buildup from the drums. Should you service the brakes or replace them? If the brake pads are worn out close to the safe limit or the discs are in a bad shape, it might be more cost effective to replace brakes instead of servicing them. How long will the brakes last if you service them now? Is a car safe to drive if you decide not to service brakes, but rather replace them later? What is the price difference? These are the questions you can ask your mechanic or service writer when weighing pros and cons of either option. Replacing the brake pads and rotors includes brake service, which means the brake components are also cleaned, serviced and lubricated. What's the benefit of servicing brakes? The benefit is that the pads will wear evenly and last longer, the caliper slide pins will not seize up, your brakes are less likely to squeak and you know your car is safe. Is servicing brakes included in the maintenance schedule? There are cars, where the periodic brake service is mentioned in the maintenance schedule, however in most cars, the maintenance schedule only mentions regular brake inspections. How long do brakes last on a car? On average, disc brakes last for 30,000-50,000 miles. Rear drum brakes may last for up to 150,000 miles. Is servicing your brakes expensive? Typically a brake service costs $80-$130 per axle if no parts are replaced. Both brakes on the same axle are always serviced at the same time. If your brake discs or drums are rusted, warped, or worn unevenly, your mechanic may suggest having them turned (machined) on the brake lathe. This costs more. Warped, or unevenly worn brake discs or drums cause the steering vibration and brake pedal pulsation while braking.